Time has come to uproot the disease of corruption from the society else it will start to eat into our system making it weak and inefficient said Arunachal Pradesh Chief Minister Pema Khandu, while addressing 33rd Arunachal Statehood Day celebration here at IG Park on Wednesday.. He said when we commit fraud or embezzlement of public funds, we must think of the million tax payers across the country who have parted with their hard earned money so that remote state like Arunachal can also be at par with other developed state. The taxpayer money is not meant for our pocket but for the development of our state, said the Chief Minister and added that the old pattern of thinking must be done away with giving way to more progressive ones. Speaking at the event, Chief Minister said on this day when Arunachal attained statehood 33 years back, the Arunachali society was not well prepared or mature enough to accept the new status. However, there was also hope and expectations among the people that with the new statehood attained, Arunachal will grow to become a self-sustained, corrupt free and developed state. Having crossed the journey of 33 years, Chief Minister said it is time to ponder whether the dreams and expectations of the people been fulfilled. 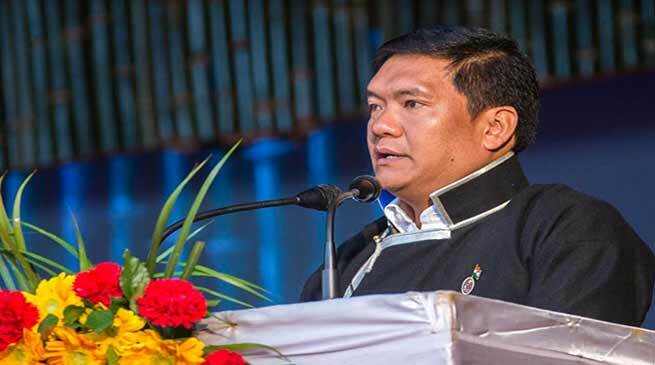 Khandu said during this course of journey, the state went through good and bad phases. He emphasized that for good days to come ahead, we must start contemplating and discuss where the state is headed. He called upon the people of Arunachal to chart a new course for the state, a new direction whereby the dreams of the people that they saw when we first attained our statehood is fulfilled. Chief Minister said Arunachal being a resource rich state and land of 1.4 million people only, looking after the welfare of these million people should not be a challenging task if there is proper policy, proper roadmaps for development along with good intentions. He said this task can be achieved if all the government machinery start to work with team spirit with the clear objective of working for the welfare of the people.